Dodge, duck, dip, dive...and dodge! Most sports involve hitting a ball, or kicking or throwing it into a goal or net, but in dodgeball you and your opponents are the target. Mike Bushell went along to investigate the sport in which you're the hunter - and also the hunted. 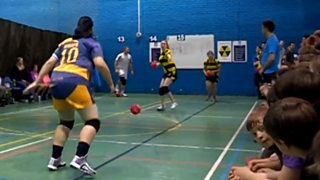 The World Dodgeball Association are hoping that staging the first Dodgeball World Cup in the UK will add to the 750,000 already playing here. "We have created a grassroots programme that takes dodgeball to non-traditional sporting environments and starts to engage with people who don't traditionally take part in sport," says World Dodgeball Association president Tom Hickson.